Pre-heat the oven to 150°c / 300°f / Gas Mark 2. Melt the butter in the saucepan over a medium heat. Crush the biscuits, add to the melted butter and mix together. Pour mixture into the flan ring and press down with the back of a wooden spoon. 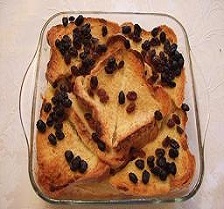 Bake in the oven for 10-15 minutes and then remove (do not allow to burn). Beat the cheese in a mixing bowl until it is soft and smooth. Beat the eggs together separately. Add the eggs, sugar, vanilla, and cream to the cheese. Bake in the centre of the oven for 30-40 minutes or until set. Bring a saucepan of water to simmering point. Break the chocolate into small pieces and place in a bowl that will fit over the saucepan. Add the grated orange rind and orange juice or liqueur. Place the bowl over the saucepan and heat gently, stirring all the time, until the chocolate has melted. Separate the egg yolks from the whites (save the whites in another bowl) and beat well. Add the beaten yolks to the melted chocolate while it is still hot. Continue beating until they are combined well. Leave to cool for 10-15 minutes. Beat the egg whites until you get soft peaks. Carefully fold the whites into the chocolate. Spoon the mixture into the ramekins or glasses. Cover with clingfilm and refrigerate for 3-4 hours. Whip the cream and place on top of the mousses. Heat the cream and vanilla pod to just below boiling point in the saucepan. In the mixing bowl, whisk together the egg yolks and caster sugar. When the cream is ready pour it into the egg mixture stirring constantly. Then return the mixture to the saucepan and heat very gently, again stirring constantly. When it has thickened, pour the mixture into the ramekins and allow to cool. 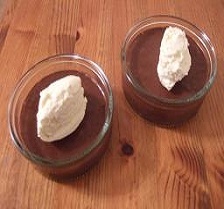 Once cooled cover each ramekin with cling film and place in the fridge until the next day. After the brulees' have set, turn on the grill to high. Liberally sprinkle each ramekin with the soft brown sugar - you need a good layer. Place each ramekin under the grill - as high as you can get it. Keep an eye on these as it is easy to burn them. As soon as the top is brown and bubbly, remove from the grill. Allow to cool and serve when required. This dish MUST be made the day before to allow the cream to set. Alternatively if you want a hot dessert, serve in the ramekins after grilling. For the caramel, put the caster sugar and hot water into a saucepan and heat gently. When the sugar has melted, turn up the heat and stir until it is dark brown in colour. 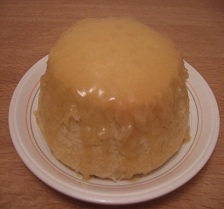 Pour the caramel into the mould and tip and rotate until the base and sides are coated roughly a quarter of the way up. Preheat the oven to 150ºC / 300ºF / Gas Mark 2. Pour the milk and cream into the other saucepan and leave to heat gently. Whisk the eggs, brown caster sugar and vanilla in the mixing bowl. When the milk is hot (not boiling) pour it into the egg mixture, whisking constantly. When thoroughly mixed, pour into the mould. Place the mould in the roasting dish and pour boiling water in to reach halfway up the mould. Place in the centre of the oven and bake for 1 hour. After an hour, gently shake the mould to see if it has set. If not leave in oven for a further 5-10 minutes until set. When set, remove from oven and cool slightly before transferring to the fridge. One hour before serving, remove from fridge and loosen the edges with a knife. Turn out onto a serving plate and return to fridge until ready to serve. Pre-heat the oven to 190°c / 300°f / Gas Mark 5. Grease and line the flan tin. Rub the flour and butter together until they resemble fine breadcrumbs and then mix in the sugar. Add water a little at a time until you have a firm dough and roll into pastry. Line the flan tin and rim off the excess. Cover the pastry with baking paper and fill with baking beans. Bake on a high shelf for 15 minutes. Bring milk and sugar to a boil in the saucepan. Whisk eggs in the mixing bowl. Pour hot milk onto eggs, whisking all the time and then leave eave to cool. When the pastry has been in the oven for 15 minutes, remove from oven. Remove baking paper and beans, return to oven for 5 minutes. Reduce heat to 180º/350ºF/Gas Mark 4. Pour egg mixture through the sieve into pastry case. Grate fresh nutmeg on top. Place in centre of oven for 20 minutes. After 20 minutes, check to see if the custard has set, if not return to oven for 5 minutes. 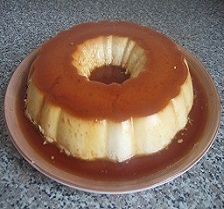 Allow to cool before removing flan tin. Store in a cool place and serve cold. Spread a little jam over each of the sponge fingers than cut into 2.5cm / 1" cubes. Put these in the serving bowl. Remove stalks from strawberries and cut into quarters. Sprinkle raspberries and strawberries over the sponge pieces. Pour over sherry and mix to coat all ingredients. Leave to soak for a few minutes. Whisk the cream with the vanilla then spread it over the custard. Finally crumble the flake over the top. Cover and place in the fridge for 3-4 hours to set. Rub flour and butter together until it resembles breadcrumbs. Mix the egg yolk and water together in a small bowl then add to the mixture. Mix all ingredients together to form a firm dough. Place in fridge for 30 minutes to rest. Preheat oven to 190ºC / 375ºF / Gas Mark 5. Liberally grease the flan tin with butter then line the bottom with baking paper. Roll out pastry and line flan tin, pressing into the corners and edges gently. Cover with baking paper and add baking beans. Place on a high shelf in the oven and bake for 15 minutes. After 15 minutes, remove beans and baking paper and return to the oven for 5 minutes. Turn the oven down to 170ºC / 325ºC / Gas Mark 3. Mix the cornflour with 3 Tbsp of the milk to a smooth paste. Heat the remaining milk in a saucepan until it is steaming but not boiling. Pour the milk onto the cornflour mixture and stir well. Return the mixture to the saucepan and boil for a couple of minutes, stirring constantly. Stir in the sugar, then remove from the heat and allow to cool a little. Using a fine grater, gently grate the lemons to remove the zest. Using a juicer, extract the juice from the lemons. Add the grated zest and extracted juice to the cooling milk and beat well. Pour the mixture into the pastry case and place in the centre of the oven for 5 minutes. After 5 minutes, gently shake flan tin to see if it has set, if not, return to the oven for 5 more minutes. Repeat until set then remove from oven. Add a little of the sugar and whisk again. Add the remaining sugar and fold in. Whisk until stiff and firm. 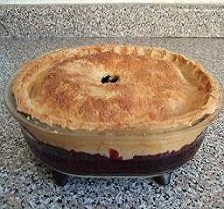 Spoon mixture onto the pie and spread to the edges, making sure the filling is completely sealed in. Make peaks in the meringue by swirling with the back of a spoon. Sprinkle a little extra sugar over the top of the meringue. 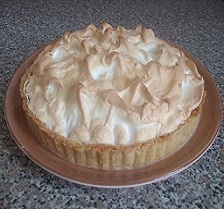 Place in the oven for 5 minutes or until the meringue has browned a little. Can be eaten hot but is best served chilled. 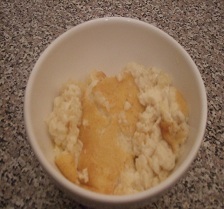 Break up the digestives into a fine mixture, a food processor is good for this. Gradually pour the melted butter butter into the biscuit mixture and work it in with the spoon if not using a food processor. Line the flan case with the baking paper and grease sides and baking paper with a little butter. 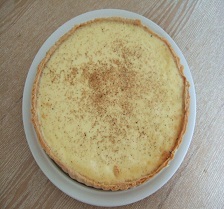 Press the biscuit mixture into the flan case and even it out so we have a nice flat base. Put the base in the fridge to cool while you make the topping. Empty the mascarpone cheese into the bowl, squeeze the limes and add the juice. Add the egg yolks, cream, vanilla extract and sugar. Mix slowly with the whisk or hand blender until all the ingredients are mixed together. Remove the now chilled base from the fridge and add the topping. Use the palette knife to press down and smooth the topping. Grate some lime zest over the top for decoration. Place in the fridge for 3-4 hours to set. Whisk the eggs whites until they form soft peaks and you can turn the bowl upside down without the eggs slipping in the bowl. Gradually whisk in the sugar, a bit at a time and you should end up with a silky looking mixture. Now you can either place blobs on the baking sheet or make one or two larger meringues. Using a metal skewer, swirl the blobs to smooth them out a little and make a peak in the middle for small ones or on the outside for larger ones. Place in the middle of the oven. Turn down the oven immediately to 140°c / 275°f / Gas Mark 1. When the hour is up, turn the oven off and leave open slightly to allow the meringues to cool completely in the oven. 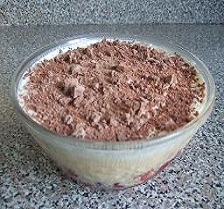 Store in an airtight container and serve with whipped cream. Grease and line the base of the flan tin with baking paper. Melt the butter in one of the saucepans. Place the biscuits in the freezer bag and crush them until fine using the rolling pin. Add the biscuit crumbs to the butter and stir well. Pour into the flan tin and spread evenly, pressing down firmly to compact the mixture. 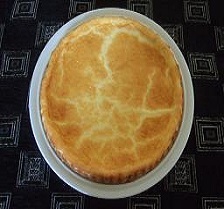 Place the flan tin in the fridge to set while you make the topping. Place the gelatine in a small bowl and cover with a little cold water to soften them. Cut the vanilla pod in half lengthways. Warm the cream slightly in a saucepan with the vanilla pod, add the drained gelatine. Remove from the heat when the gelatine has dissolved, stir well and leave to cool. In a mixing bowl, whisk the egg yolks, ricotta, sugar and vanilla essence. Strain the cooled cream into a separate bowl. Whisk the cream until it is thick but not stiff. Gradually beat the ricotta mixture into the whisked cream. Pour the mixture over the biscuit base. Use the palette knife to press down and smooth the topping and then place in the fridge. Leave to set for at least 2 hours, preferably overnight. Place the gelatine leaves in cold water and allow to soak for about 10 minutes. Mix milk, cream, and vanilla pod in a saucepan. Put on a medium heat and bring slowly to the boil. Squeeze the gelatine leaves in your hand to remove most of the water. Add them to the saucepan and stir well until dissolved. Remove from heat and strain mixture through a sieve. Pour into 4 martini glasses and refrigerate for 12 hours. 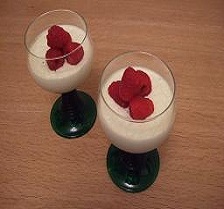 Before serving garnish with raspberries. Pre-heat the oven to 180°c / 350°f / Gas Mark 4. Rub the flour and butter together until it resembles fine breadcrumbs. Add the sugar and mix it in well. Peel and core the apples then slice thinly. Put the apples, sugar and cinnamon in a saucepan and heat gently until the apples have softened. Pour the apple mixture into the roasting dish and sprinkle blackberries on top. Cook in the oven for 30-40 minutes or until the top has started to brown. Pre-heat the oven to 220°c / 425°f / Gas Mark 7. Rub the flour, lard and butter together until it resembles fine breadcrumbs. Add the water and mix it in until you have a pliable dough. Set the dough aside to rest. Put the apples straight into the roasting dish and sprinkle blackberries on top. Sprinkle the sugar over the blackberries. Roll out the pastry so that it is roughly 1 " / 2.5 cm larger than the dish. 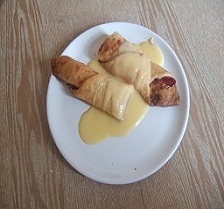 Cut off a strip of pastry 1" / 2.5 cm wide and dampen with a little of the glazing milk. Press the strip around the top of the dish and moisten with a little more of the milk. Now place the pastry over the dish and press the edges to the strip. Trim off the excess and cut a hole in the middle about 1" / 2.5 cm round. Glaze the top of the pie with milk then sprinkle the extra sugar on top. Cook in the oven for 10 minutes then reduce the heat to 190°c / 375°f / Gas Mark 5. Cook for a further 30 minutes. Divide butter into 4 portions. Rub 1 portion of butter into flour and mix in sugar. Add water a little at a time until you have a pliable dough. Roll out pastry into a long rectangle. Using 1 portion of the butter, place blobs of butter over two thirds of the pastry, avoiding the edges. Fold over the end without butter to cover half of the butter, and then fold over the other end. Press edges together to seal the butter in. Give the pastry half a turn and roll out again gently. Repeat the above until all the butter is used up. Roll out once more, fold and place in the fridge for 1 hour. Chop roughly and put in saucepan with sugar, cinnamon and water. Cook over a medium heat until softened slightly. Pour into ovenproof dish and leave to cool. Remove pastry from fridge and roll out to a little larger than the pie dish. Cut off a strip about 1cm / ½” wide. Dampen the top edge of the pie dish and press the strip all around the rim. Dampen the strip then cover with the pastry, pressing firmly to seal the top. Brush the top with milk and sprinkle with sugar. Place in the centre of the oven for 10 minutes. Reduce heat to 190ºC / 375ºF / Gas Mark 5. Continue to cook for 20 minutes, until golden brown. Serve with whipped cream, ice cream or custard. Butter the bread and cut in half. Liberally butter the ovenproof dish. Using half of the bread, arrange one layer of bread in the dish. 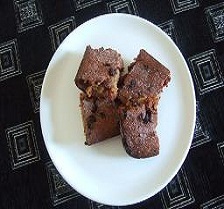 Sprinkle half of the sultanas over the top. Arrange the remaining bread over this and finish with the rest of the sultanas. In the mixing bowl, whisk the eggs together. Now whisk in the sugar and vanilla. Finally whisk in the milk. Pour the mixture over the bread and allow to soak for a few minutes. Grate nutmeg over the top. Place in the centre of the oven for 35-40 minutes. 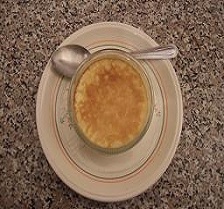 Serve hot with custard or ice cream. Remove the crusts from the bread and tear into small pieces, then put into mixing bowl. Pour the milk over the bread and stir well to ensure all the bread is coated. Leave to soak for about 30 minutes. Melt the butter over a medium heat. Beat the egg in a small bowl. Add the butter, egg, mixed spice and sugar to the bread. Beat really well until smooth and there are no lumps. Stir in the dried fruit. Pour mixture into the buttered dish and grate nutmeg over it. Bake in the centre of the oven for 1¼-1½ hours. After removing fron oven sprinkle with sugar. Serve hot with custard or lovely cold with a cup of tea. Keep any left-overs in an airtight container. Pre-heat oven to 200°c / 400°f / Gas Mark 6. Grease flan tin well with a knob of butter. Lay pastry over the tin and press into edges, trim around edge. Place a sheet of baking paper over this and fill with baking beans. Bake in oven for 20-25 minutes or until golden. When pastry is ready, remove beans and paper. Melt the butter, sugar and syrup in the suacepan and remove from heat. Carefully mix in the cornflakes until they are coated with the mixture. Cover the base of the pastry with the raspberry jam. Put the cornflake mixture over the top and pop back in oven for 5-10 mins. 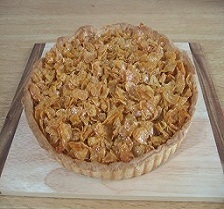 When the cornflakes are starting to brown, remove the tart from the oven. 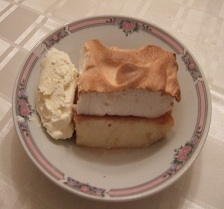 Serve with custard, cream or ice-cream. Pre-heat oven to 180°c / 350°f / Gas Mark 6. Grease the pie dish liberally with butter. Bring the milk to the boil in the medium saucepan. Cut bread into 1cm/½" cubes. Place bread cubes in a large mixing bowl. Add the butter, 50g/2oz sugar and the grated lime rind. Pour in the milk when it has come to the boil. Stir well then leave to cool, stirring occasionally to break up the bread. Separate the eggs, setting the whites aside for later. Beat the yolks well and add them to the milk and bread mixture. Stir well then pour into the buttered pie dish. Melt the jam in the small saucepan over a low heat. When the base has set, remove from oven and spread the jam evenly on top. Using the medium mixing bowl, whisk the egg whites until stiff. Gradually whisk in 50g/2oz sugar. Spread the egg whites over the jam and then make swirls using the spatula. Sprinkle the remaining 1tsp sugar over the top. Return to the oven and bake for a further 15-20 minutes. Pre-heat oven to 150°c / 300°f / Gas Mark 2. Grease the roasting dish liberally with butter. Pour the milk into the saucepan and add the rice. Heat gently until the rice has softened (approximately 10 minutes). Continue to cook gently until the milk has thickened (further 10 minutes). Add the butter, sugar and vanilla and stir until dissolved. Remove from the heat and allow to cool for a few minutes. Beat the eggs in the small bowl and add them to the saucepan. Stir well then pour into the buttered roasting dish. Place in the centre of the oven for 35-40 minutes or until the top has browned. Roll out pastry you have on the sprinkled flour, a rectangular shape is best. Just use any leftover pastry from making pies, tarts or cakes. Spread jam of your choice over the pastry. Roll the pastry over at a 45° angle. Place in the preheated oven for 20-25 minutes. Cream the butter and sugar together in the mixing bowl. The mixture should become very soft and pale in colour. Add the eggs one at a time, followed by the milk, beating well until they have combined with the flour and sugar. Sieve the flour into the bowl and fold in to the mixture gently. Now add your dried fruit, again folding gently. Grease the basin well and pour in the batter. Poke a little hole in the top with your finger and add a knob of butter. 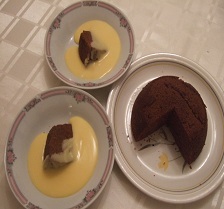 Fold a crease in the middle of the foil to allow the pudding to expand. Place over basin and tie around the top with string to secure. Place in steamer and steam for 1¼-1½ hours. 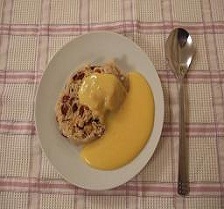 When ready turn out onto a plate then serve with custard, cream or ice-cream. Beat eggs in a small mixing bowl. Add the eggs to the creamed butter and beat well. Add the flour and cocoa a little at a time and beat well. Pour the mixture into the prepared basin and cover with a disc of baking paper. Cover top well with kitchen foil. Place in the steamer and steam over boiling water for 1½ hours. 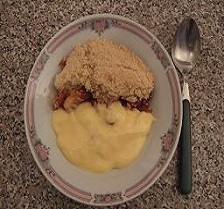 Turn out and serve hot with custard, cream or ice-cream. Put the lemon curd in the bottom of the basin..
Grate the lemon rind into the large mixing bowl. Add the butter and sugar and cream until light and fluffy. Beat eggs in the small mixing bowl. Add the juice from the lemons and beat well. Add the flour a little at a time and fold in. Pour the mixture over the lemon curd in the basin and cover with a disc of baking paper. A lot of the features of the site won't work. The cookbook is beautifully illustrated with pictures for every recipe and easy to follow instructions set out over more than 200 pages. Take a look at the cake section of the cookbook before you buy it. The complete cookbook has over 100 recipes all indexed for easy reference, split into sections which match the website. Using the bookmarked table of contents your just 1 mouse click away from any recipe. Try the preview and see how simple it is. All sorts of soup recipes, lunch recipes and snack recipes. Classis soups like Chicken, Tomato and Stilton and Brocolli and a selection of soups inspired from our travels. Lunches and snacks include pitta bread pizzas and bacon and tomatoes. Cold and hot starters to get the taste buds jangling. Healthy Rice Salad and Onion Salad that are very easy and cheap to make. Hot starters like Cheesy Garlic Bread and garlic Mushrooms to wet the appetite. Homemade dinner recipe favourites like Bolognese, Old Fashioned Mince and Lasagne. Lots of different pies such as Beef and Ale Pie and Shepherds Pie. Meals for entertaining guests such as Beef Bourguignon and Moussaka. Plus a nice selection of spicy dinner recipes such as Chilli Con Carne are all on this page. Homemade dinner recipe favourites like Chicken Kiev, Chicken Pasta Bake and Quiche Lorraine. Also lots of meals for entertaining guests such as Coq Au Vin, Stuffed Chicken Breast With Parma Ham and Spaghetti Alla Carbonara. A nice selection of spicy dinner recipes such as Chinese Pork with Honey are also on this page. A lovely selection of vegetarian mains such as Ratatouille and fish and seafood mains including fish and chips. All sorts of spicy curry recipes such as Chicken Jalfrezi and Lamb Vindaloo. Homemade cold and hot side dishes to enhance the mains or as a compliment to salads or cold meats. These cheap side dishes are very easy to make and really go well with most dinners. Cold and hot dessert recipes that really finish off a meal. Whether entertaining or just cooking for the family these dessert recipes are a real winner. Delicious homemade cake recipes and pastry recipes, naughty but ever so nice. 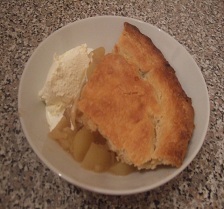 The children love these recipes and homemade biscuits are so much better for them than the packet variety.